Summary TAD THE LOST EXPLORER AND THE SECRET OF KING MIDAS is a Spanish animation adventure, dubbed in English, in which an explorer has to stop a villain from finding a magical necklace. 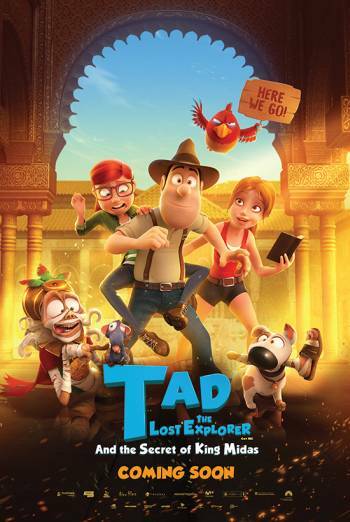 TAD THE LOST EXPLORER AND THE SECRET OF KING MIDAS is a Spanish animation adventure, dubbed in English, in which an explorer has to stop a villain from finding a magical necklace. There is mild threat in a scene in which adventurers get trapped in a cave filling up with water. Another scene shows a woman being turned into a gold statue. Mild violence includes a scene which shows plates being thrown at villains. Other moments show characters being zapped and shot with truth serum darts, without any detail. Very mild bad language includes uses of 'heck'. There are also several references to a woman being 'hot'. Paramount Pictures UK,Paramount Pictures c/o Universal Pictures (UK) Ltd.